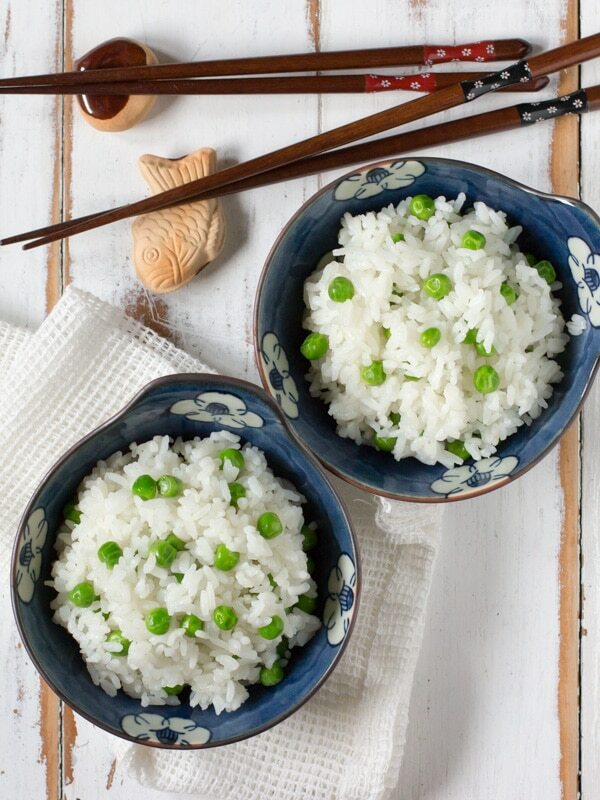 Mame Gohan, which is rice with green peas and some salt flavour, is a variation on regular white rice and a delicious twist on a classic Japanese side dish. Just like Takikomi Gohan, Mame Gohan makes a boring bowl of white rice more interesting and gives it more flavour! The green peas add a pop of colour and add an extra serving of veggies to your meal! 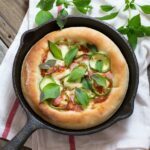 It’s such a simple twist but it really makes a difference and gives it a different flavour! On the weekend I like to go to the organic markets and get my veggies and fruits for the week. Last week when I went I found some really fresh sugar snap peas so I decided to make Mame Gohan with them! I made a batch of it when I got home and it was all eaten within a few minutes after I had taken some photos. 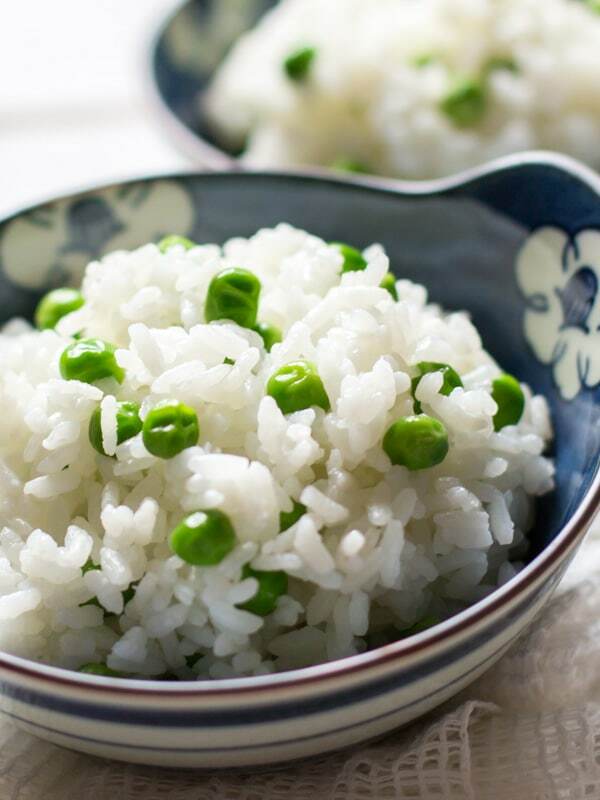 My daughter doesn’t usually like peas but she loved this rice so give it a try even if you are not a big fan of peas because you may actually like it. My mom often used to make Mame Gohan when I was a child and I hated it! I would always say “eww noooo” but she would still make it and I would just have to suffer. But now, for some reason, I really like it and ate a big bowl of this batch when I made it for this post. The slightly salty flavour makes the rice taste so good and the peas add their slight flavour too. To keep the peas looking fresh and bright green, slightly cook them then add them to the rice about 10 minutes after it’s finished cooking. If you cook it all together in the rice cooker, the peas will go dark and dead-looking. Once it’s all cooked you can serve it with any dish just like you would plain rice! Enjoy! Love the simplicity! Bright and beautiful. Oh, I love Mame Gohan! It’s so simple, but it really adds an extra oomph to any meal. Thank you Revathi 😀 Me too, love rice and any kind of peas. I am going to make Azuki beans one soon as festive season is just around the corner. 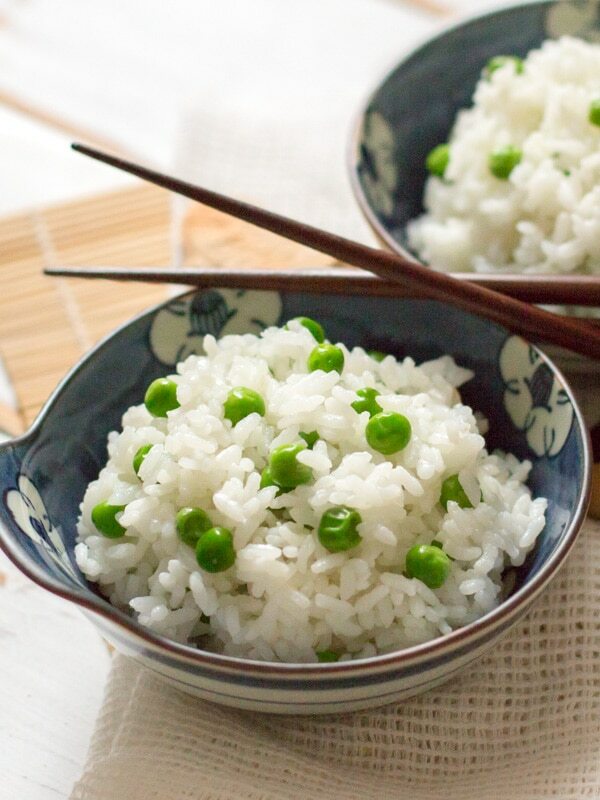 Those fresh green peas are so pretty and sound like a great addition to rice! 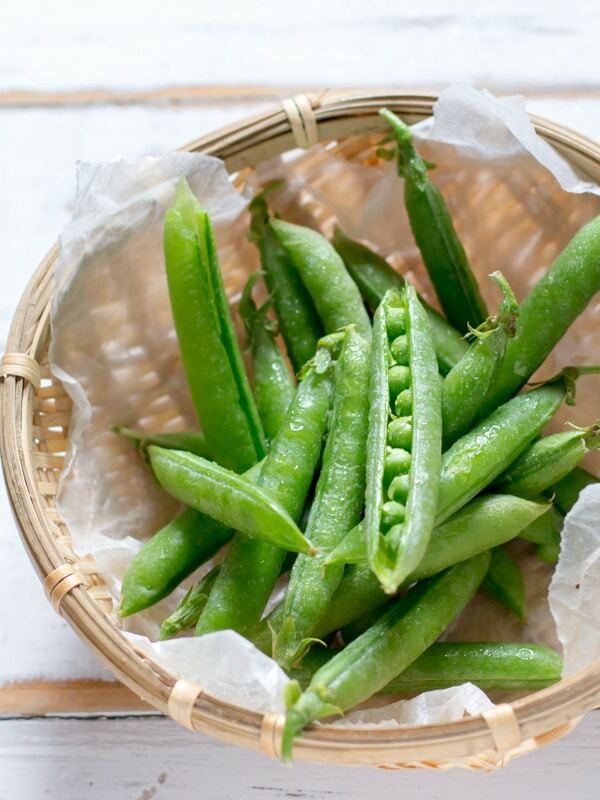 Thank you Joy:D. Green peas are now in season in Australia and are very yummy. Love this. Perfectly toddler friendly as well. 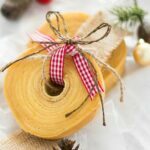 I will be making this for my little guy – and me of course! Thank you Cristie:D I am sure your little guy will love it<3 Fun to eat little green geas! I frequently cook flavored rice with green peas. I know this will be popular at our house. Hi Linda, Thank you for visiting my blog:D What flavour do you add? Would you mind to share? One of the Indian restaurants I eat at puts peas in their rice. I don’t make a lot of rice, but have always had their rice on my mind, so one of these days I will make it. Hi Willo, thank you for visiting my blog. I have learnt a lot that peas are used in Indian rice dishes too. I wonder what flavour they put in. I am sure they are yummy too. 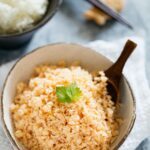 I just love your food, everything you produce is always amazing, and this rice is so simple – just perfect! so many bright colorts good work!